A roster of the dream. You could walk into any Toys ‘R’ Us, KB Toys, or Lone Star Comics and see on the shelf any of one those beloved action figures. Except Gambit (and Iceman, but his toy was stupid.) You see, much like the De Beers diamond cartel, toy companies intentionally withhold certain figures to create a demand. So when a box of X-Men figures shipped, its contents included plenty of Banshees, Forges, Saurons, and the three different versions of Wolverine. But the a Gambit figure might be only one per box, or even none at all. So in order to conduct my manhunt, I called previously listed toy stores everyday for about 6 months. To this day I still have the Toys ‘R’ Us number memorized. Even though it’s been closed for about 10 years. My phone call went something like this. Toys’R’Us Representative: Thank you for calling Toys’R’Us how can I help you? Little Jack: Um..I was wondering if you’ve gotten your shipment in for the day. Toys’R’Us Representative: Is this Jack? Toys’R’Us Representative: What is it you’re looking for again? Power Rangers? Little Jack: No, I’m looking for any shipments of the X-Men Series 2 action figures. Toys’R’Us Representative: Hold on, let me check. Toys’R’Us Representative: We did, but didn’t get any Gambits. And that’s what I did with my childhood when I wasn’t playing video games. So why am I telling you about this? Well I’ve been out of a job for a few months now. I’ll spare you the details of my rise and fall from the reality TV world, my adventures of the writers’ room of an unnamed but super mega awesome scripted TV show, and finally my depressing return to the restaurant frontier. I decided once and for all to do what it takes to get the office Production Assistant job that is so coveted by any and all aspiring TV writers. Between Deadline, Below the Line, Che Equis’s Temp Diaries, and a few secret tracking boards, I’ve managed to compile a list of television pilots currently in either development or production. (See below). This is just a sample of the document in my Google Drive. In actuality it spans over 100 pilots. And each day I update the list’s phone numbers, status, and then scan for who I have slated to contact for the day. Then I call. Production Intern/Assistant: Something Something Productions. Adult Jack: Hi, I was calling to see if the production company of [insert show name] pilot has been set up yet. Production Intern/Assistant: Oh I uh…I don’t think so. Try calling back in a month. (They always say a month). Not the best answer in the world, but at least you can try them again. Production Intern/Assistant: Yeah, here’s the production office number. This is actually bad, because most likely if the production office is set up, then it is staffed up too. But still worth a shot. Production Intern/Assistant: No not quite yet. Probably next week though. That’s the answer you want! Adult Jack: Great! Has a line producer or production coordinator been hired for the project. Adult Jack: Wonderful. Might I be able to forward my resume to them for staffing? And it goes from there. Then you have to check back. So as you can see, I can’t help but feel the parallel between my adulthood and childhood. It’s a slug, but you gotta do it. 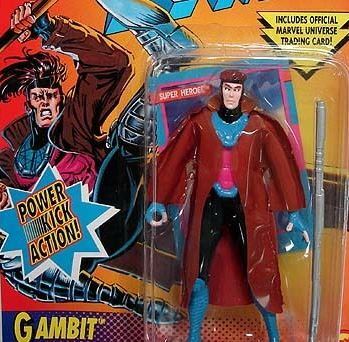 Sad fact: You know how I finally got the Gambit toy? My friend found one for me. Which sadly, despite my best efforts, is probably what I am going to need to actually land the job.